The quare fella from Tipp suggested to try this and so I did. Go to Google and type in Why and see the suggestions it gives as you type. This entry was posted on Wednesday, December 23rd, 2009 at 11:06 pm	and is filed under funny, irishblogs, technology. You can follow any responses to this entry through the RSS 2.0 feed. Both comments and pings are currently closed. Torontoist did a great little post about this a while back. Endlessly fun. Strangely enough, two options on my list were, why vote yes and why vote no to Lisbon. I also got, why do dogs eat grass, not poop 😛 Is there a method to this madness? This would be heaven for a four year old, if they could read! 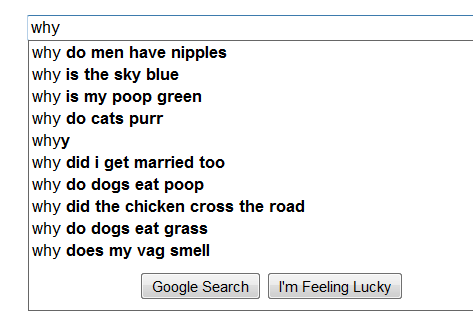 Enthralled with why some people’s poop is green, I have discovered that “Why is my poop blue?” is also a very common search. Lay off the blue Smarties I say! What you’re looking for is this: http://autocompleteme.com/ – Basically a list of all the oddest autosuggestions google has to offer. I’ve been slowly adding as many user-generated sites as I can find to this list: http://www.apeofsteel.com/646/list-of-usergenerated-sites, but it’s probably a losing battle. Funnier still is that these suggested queries are somewhat geotargeted, so this is likely what folks in Ireland are searching for if you start off on google.ie.